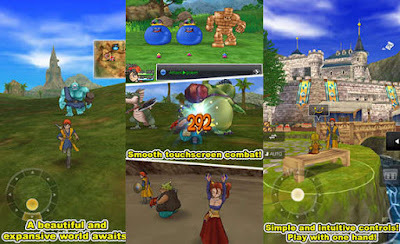 You can now play DRAGON QUEST VIII 1.1.3 English version right on your Android. This port dubbed Journey of the Cursed King is one of the classic and most popular JRPG games ever, and it's brought to you by Square Enix America. You play as a traveller that ends up a hero embarking on an epic adventure. There are other travellers in your company including a monster and a horse who have been cursed by some great magician. Together, you will journey the open environments, fighting monsters and trying to break the curse that befell the kingdom. It added support for Android OS6.0. It added support for Traditional Chinese. Install v1.1.3 APK, Extract Obb Data and copy ‘com.square_enix.android_googleplay.dq8’ folder to sdcard/Android/obb/ , then run the game. More than 1.4GB, and Android 4.0+ is required to fully install DRAGON QUEST 8. And 4.4 devices may experience problems initialising the app under ART. If you face any problems, comment. NOTE: Make sure you don't run the game until you get the OBB folder in place. Otherwise you'll likely need to clear cache data as well. If you're getting the little white square in the bottom corner, make sure you haven't put the obb file in obb, on its own. It needs to be in the appropriate folder (com.square_enix.android_googleplay.dq8), in obb!